Topics: Aircraft Types, English, Italiano, and EspaÑol. It is hosted by Monstercommerce Llc (Illinois, Belleville,) using Apache/2 web server. It has 2 DNS records, ns18.worldnic.com, and ns17.worldnic.com. 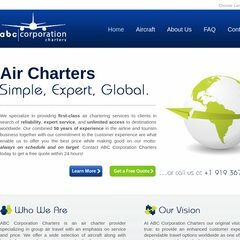 Abccorporationcharters.com's server IP number is 206.188.193.193.